Posted on January 20, 2011 by Jill B. Once again, SanDisk is striving to set itself apart as a leader in USB and flash technology with the brand new SecureAccess software that begins with the SanDisk Ultra USB and the SanDisk Cruzer Edge. SecureAccess allows you to share your USB flash drive with other users while safeguarding the privacy of your most sensitive content by securing your files in a 128-bit AES encrypted folder. SanDisk appropriately coined the term “vault” for the function of this USB software. By selecting what goes in your private partition, you are able to control file access while sharing. This concept has an edge over the encryption of an entire flash drive. For example, not all of your files may require the same amount of privacy, so you’d like to share the USB drive with family, friends or colleagues. With SecureAccess, you can share the files you want without having to give away your password. At the same time, you are able to keep your confidential information private. Choosing the location of your files is as simple as dragging and dropping them into specified folders—be it encrypted or open. The encrypted vault expands with the number of files it is given since it does not have a determined capacity to begin with. Moreover, SecureAccess users have the option to take advantage of Dmailer cloud storage for up to 2GB as a means of online backup. SecureAccess will be available on all new SanDisk flash drives. The USB software will simultaneously debut with the SanDisk Ultra USB and the SanDisk Cruzer Edge. The Ultra USB is a red and black flash drive with a slide out metal connector. It transfers data at up to 15MB/s. The storage capacity ranges between 8GB and 32GB, priced approximately from $45 to $110. The SanDisk Cruzer Edge is another red and black slider flash drive that varies slightly in its shape compare to the Ultra model. Capacities also vary at 2GB to 16GB. While smaller in storage they are also less expensive ranging from $13 to $80. SecureAccess the Cruzer Edge will be released later this month with the debit of the Ultra USB coming later in the quarter. What’s great about SecureAccess is that it gives you two types of flash drives in one. This kind of flexibility in terms of security is a promising trend because it adapts to our demands for both privacy and communication. Thoughts on SecureAccess? Do you think it’s a smart move by SanDisk to offer the software on all future flash drives? This entry was posted in Flash Drive, Flash Memory Future, SanDisk, SanDisk Corporation, USB Flash Drives, USB Future, USB software, USB Technology and tagged SanDisk, SanDisk Cruzer Edge, SanDisk SecureAccess, SanDisk SecureAccess USB Software USB Flash Drives, SanDisk Ultra USB, SecureAccess, SecureAccess software, Software Plus SanDisk Flash Drives, USB software. Bookmark the permalink. In use it is fiddly the software is on the drive and its files are visible which makes it untidy; I have an old Kingston drive on which nothing is visible. even when you plug it in it is not detected until the password is entered into a small application on your computer. Really really disappointed that usb drives no longer as secure as in older Sandisks. I could’t care less about sharing some files. I want my entire usb protected in the event I lose it. I don’t want the finder to have a clue as to my identity via possible pictures or documents that may be present in the unsecured area. and it has some email and a google phone no for the person to return it and maybe receive a reward. There are many trustworthy people on the planet still who would rather return it to the rightful owner.. And you need some info on it so that they can email you. Not everyone is going to give to the nearest police station.. they will just toss it..
That is so true, I have used the U3 before and didn’t like it. I also use Truecrypt on my other USb sticks but they are very tedious to use as you have to format the whole drive and nothing is accessible unless you mount the drive and input the password. Also with Truecrypt, once you insert the usb stick onto the computer, it asks you if you want to format it, I made a mistake once and lost all of the files in the stick. 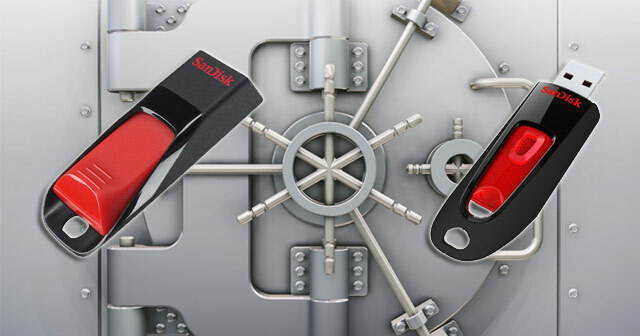 With the current Sandisk Secure Access, the drive is still accessible and you can put any file outside of the vault which is easily readable, while sensisitive files are left in the vault and only you can access it. I like this a lot, it has answered all my prayers so far. forogt to mention above that the Vault can be easily deleted, but that is the whole point, no password, no access, if you lost the stick and landed in the wrong hands, at least the files get deleted, and not accessed by anyone.